Previously a mystery because no trauma was found, studies have found the reason so many bats are dying around wind turbines, even at low wind speeds. It is because the air pressure vibrations caused by the turbines actually causes their sensitive lungs to explode. It is difficult to estimate bat deaths at wind turbines because they are small and quickly scavenged. But it is known that their deaths far outnumber that of birds and we know that over 440,000 birds each year are killed at wind farms in the U.S. alone each year according to the Fish and Wildlife Service, so the number of bat fatalities at wind farms could top a million each year, in order to provide under 3% of U.S. electricity. And newer turbines, while potentially safer for birds, are actually worse for bats. 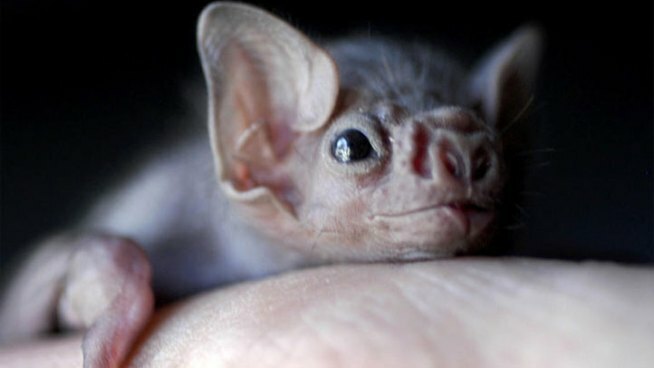 Bats are a unique mammal and an important part of ecosystems. One of their effects is to keep certain insect populations, like mosquitoes, under control. 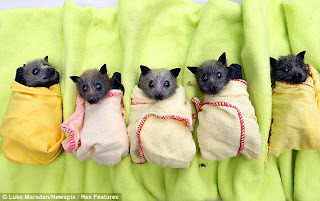 Like many mammals, they have relatively long lives and have few offspring, so there are worries that bat populations may not be able to recover, especially if wind turbines continue their expanse. And unfortunately, because many of the species being killed are migratory, the effects on ecosystems in Mexico could be effected by wind turbines in Canada. If wind advocates have their way, wind power would expand almost 7x, up to 20% of U.S. electricity (ok, between 0% on windless days and flooding the grid on too windy of days), and require about 20,400,000 acres of land (37,500 square miles, larger than the state of Indiana). Below, some gratuitous baby bat cuteness. Sooo cute, and so sad that wind turbines do this! In ornithology this past semester, my professor spoke specifically about how wind turbines are causing extinction of more than one endangered species of birds by providing an unnatural protection for their predators. I think there are more problems with these structures than many realize- it may not seem like it, but the American prairie habitat is disappearing, and putting wind turbines in these lands may be putting an end to the only wild prairie land left in the world.